In 1951 the Yankees trained in Arizona instead of Fort Lauderdale. The dry desert air and higher altitude are conducive to the longball, and Mickey made the most of it. 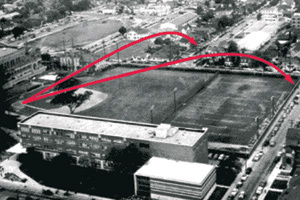 Bovard Field at the University of Southern California is a small ball diamond with a football field adjacent to right and right-centerfield. A street runs outside and parallel to the leftfield wall, with a number of houses in the neighborhood across from the park. During the game Mickey belted two spectacular blasts, one from each side of the plate. They were two of the longest home runs ever seen. The first blast, hit right-handed, was a high drive that easily cleared the left-field wall. It crossed the street running parallel to the park and traveled more than 600 feet before landing on the roof of the third house down on the street outside Bovard Field.